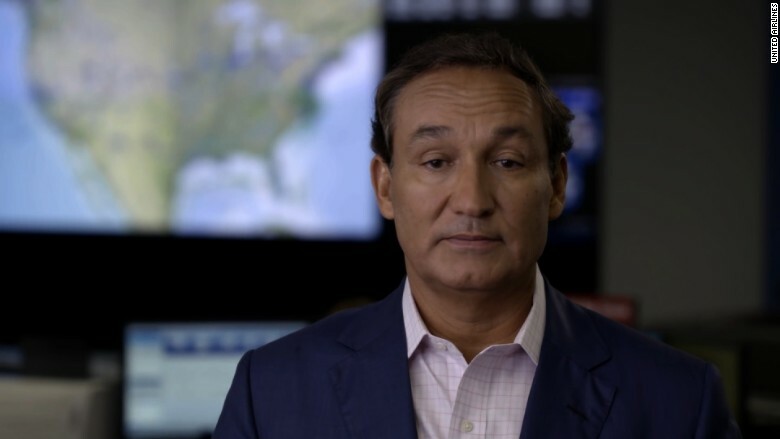 United Airlines' CEO Oscar Munoz is recovering from a heart transplant. United Airlines CEO Oscar Munoz is in recovery after undergoing a heart transplant operation Wednesday. Munoz, 56, could be back at work by springtime, the company said in a statement. Munoz was hospitalized in October after suffering a heart attack. United (UAL) said Wednesday's surgery "was considered the preferred treatment and was not the result of a setback in his recovery." Heart transplants are typically performed when a patient has a severe heart condition. Dr. Jon Kobashigawa, Cedars-Sinai Heart Institute's director of heart transplants, said patients can have an immediate turnaround after a successful transplant. "They're up and around after two, three, four days," Kobashigawa told CNNMoney. He added that in as little as six weeks a patient can be back to running on a treadmill. He said a three-month time frame is typical for returning to work, however, to avoid risk of infections and other complications. Munoz's heart attack came just five weeks after he was named United's top executive. Brett Hart, the company's general counsel, was named the acting CEO on Oct. 19, 2015. At the time, the company did not give a time frame for Munoz's return. But on Wednesday, United said it "expects him to return to United at the end of the first quarter or the beginning of the second quarter" of United's fiscal year, which indicates he could be back within three months. Munoz took over during a tumultuous time at United. He was hired as CEO from outside the company after Jeff Smisek was forced to resign due to a scandal involving the Port Authority of New York and New Jersey. The incident is part of an ongoing federal investigation. Munoz previously served as president of railroad company CSX (CSX). He also had stints as an executive at Coke (KO), Pepsi (PEP), AT&T (T). Data from the United Network for Organ Sharing shows about 4,169 patients were on the waiting list for a donor heart as of January 1. When an organ becomes available, patients are selected based on medical urgency along with other factors including blood type and body size, according to UNOS.